Today I have the exciting opportunity to feature MonkeyDo Diapers. I have known Morgan for many years and know how high of quality her products are. Morgan knows just about everything to do with cloth diapers and anything else you need to know about babies! If you are new to cloth diapers read this post, Morgan has included a ton of info and you can contact her if you have any other questions. MonkeyDo Diapers are one size fits all cover-and-soaker combo that have some innovative and unique features making them easy to use, easy to care for, and easy to love! The elastic cord-locked legs adjust to fit every size baby to keep messes where they belong--INSIDE the diaper. The body also adjusts with a simple fold rather than snaps to fit the rise of any baby perfectly. The waterproof layer is on the inside of the diaper cover and is soft on the baby's skin. It stays dry and keeps the cute cotton print outer layer dry, making it possible to use the cover several times before washing. You can pick your own cotton print or choose from those found on the "shop" page. This is by far the trimmest (and cutest) diaper around! Cloth diapering will save you hundreds of dollars and it is certainly better for the environment than using disposables. Cloth diapered kids often potty train earlier and have fewer diaper rashes. Worried about all the work it would take to care for them? It's easier than you might think. I rinse off the dirties in the tub (or you could get a diaper sprayer that attaches to your toilet) then I keep them in a pail until laundry day (every third day). I toss them all in the washer and rinse on cold to prevent staining, then wash on hot with a gentle detergent. Dry 'em in the dryer without a dryer sheet or hang them on a line to save energy (if you line dry, you can also skip the cold rinse because the sun takes care of the stains) and they're ready to go! MonkeyDo Diapers are economical, eco-friendly, and absolutely adorable! I'm lovin' this leopard print one! There are SO many fun patterns to choose from for your cloth diapers. Check out the girly prints here and the boy prints here. Morgan's Mei Tais are my FAVORITE! I have seen her use them along with her sister and they are genius! They can be worn on your back or in front of you. What a great money and back saving item to have. Watch a video here of how they work. Also available from MonkeyDo are Monkey On My Back Mei Tais. 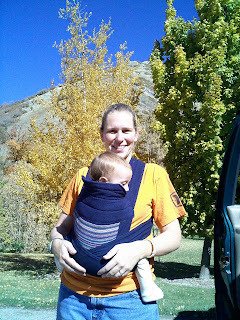 With no buckles or other hardware, these are the most comfortable carriers around. They put the majority of the weight on your hips so they are especially great for people who have difficulty wearing their baby or toddler due to back, neck, or shoulder discomfort. They are available in a variety of beautiful fabrics, so you can wear your baby in style with a Monkey On My Back Mei Tai! Thanks for all the great info Morgan, now check out her website and her facebook page.